Today I’m going in on The Summer of Skills series over at Brassy Apple. 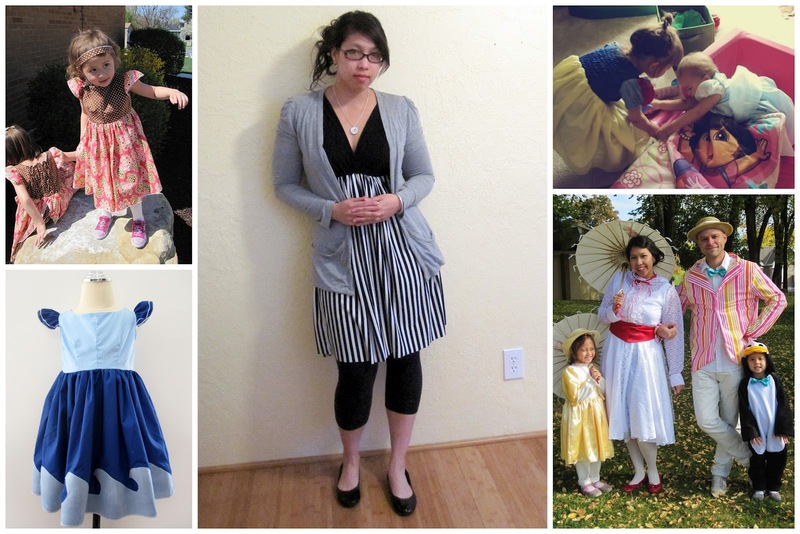 I’m sharing my trick to how I gather all those princess dresses I make for my nieces and that upcycled tank dress that I shared in this weeks What We Wore, Read and Made Link Party post. It saves me tones of time and frustration. I hope you’ll pop over and take a peek. If you’re visiting from Brassy Apple welcome it’s great to have you. I hope you’ll hang out for a little bit. If you need some places to start here are some of my favorite posts for the Summer. Fabric Painted Dresses – great to do with the kiddos and then you’ll have something they can wear and brag about and of course you can make anything not just dresses from your own fabric. Cheesecake Factory Knock Off Bread – you know that brown bread at the Cheesecake Factory? Yeah we were obsessed so I hacked the recipe and I think I did a pretty good job. I am so excited to be apart of Megan’s Summer of Skills. Today I want to share with you a really handy way to gather if you are working with a lot of of fabric or heavy fabric. Most of you who sew probably have been taught to gather by pulling basting stitches. To do it right and save you trouble in case one thread breaks you’re usually told to do two rows of basting stitches and pull. That works like a charm for sleeves and other small pieces but when I’m doing a skirt I find that method to be a pain and I usually end up snapping both threads any ways. What I do instead is zig zag over a piece of crochet thread and then just pull to gather. Since the crochet thread is thicker you don’t have to worry about it breaking and you have tons of control so you can distribute the gathers much more evenly without worrying that everything will come undone. First grab yourself some crochet thread. Set your sewing machine to a nice big zig zag I usually do 4 for the length and 5 for the width. What you want is a nice big zig zag that will go over the crochet thread without you having to be too careful. Then lay the thread where you want the gathers and start to sew making sure not to have the needle touch the crochet thread and making sure you back stitch at the beginning and end. When you reach the end of what you need to gather cut the crochet thread leaving a long tail. Then pull to gather. Tie or tack down the ends with a pin and distribute the gathers as desired. And that’s how to gather the easy way! I used this on tons of dresses for my nieces as well as for my quick and upcycled tank top dress shown above that has somewhat become my Summer uniform because they are so easy to make and comfy to wear especially when gathering like this. Here are some projects I’ve used this technique with but really anything with a lot of gathering like curtains, clothing, aprons, etc. would be a perfect project for this. Want another great sewing trick? 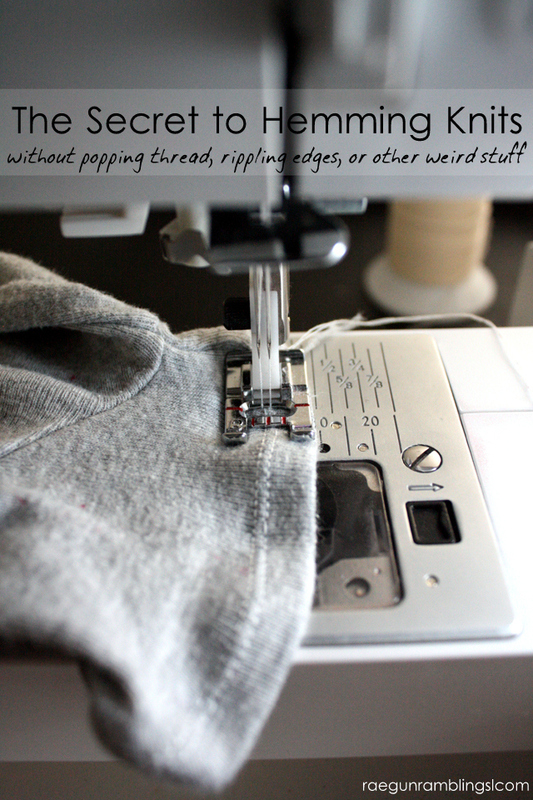 Check out my secret to hemming knits! 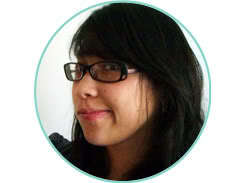 I’m a new follower and would love if you followed me back at http://iheartpears.blogspot.com. You have so many cute ideas and clothes! that is a great idea. :) I wonder if I could use embroidery floss instead of crochet thread? I have tons of embroidery floss… maybe I’ll try! Absolutely! Essentially, any yarn, embroidery thread, etc. that is thicker than standard thread will work great! 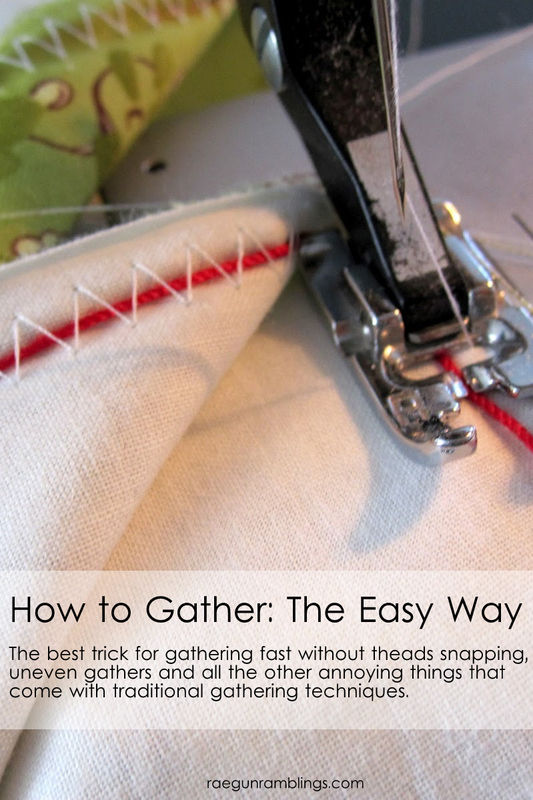 This is a wonderful “tip” and saves a lot of “I hope the thread doesn’t break” when gathering! 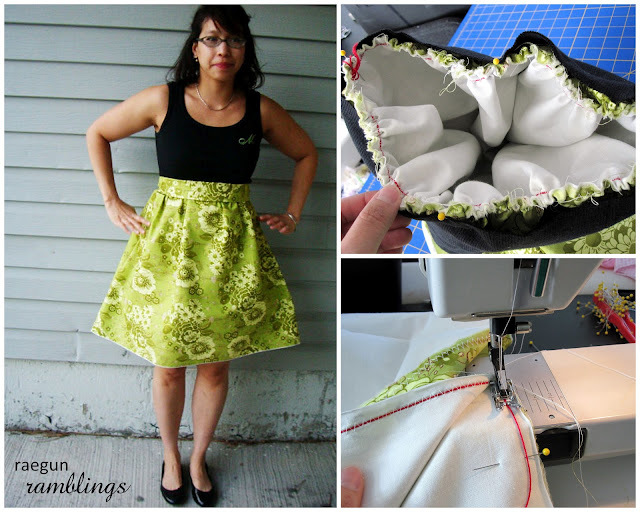 I haven’t been sewing very long so this is an awesome trick to learn! It will be nice to gather without breaking the thread!! thank you for your little tutorial on gathering — it was nicely done! very helpful! So somehow, I’ve missed your Mary Poppin’s costumes and I am in love! I love so much of what you have made! Thanks for sharing this tutorial. I’m glad you linked up at Romance on a dime! Such a great idea. I HATE gathering, especially when it involves a lot of fabric. We’d love for you to share this post at our Finished Friday Blog Party. What a brilliant idea! I am so going to use this tip the next time I need to gather something. I always seem to have a hard time with it. I am also your newest GFC follower. I always find myself clicking on your posts from linky parties. I hate gathering, even small stuff. I always break the threads. I just used this tute to gather a skirt portion of a dress. I am sold. You are a genius! Thank you for sharing your knowledge. Wow.. Love this idea as i always have trouble ! amazing idea… I’m so thankful! Great idea but I’m doing something wrong. Do I need to use a double needle? How do I get the crochet thread to be straight on the back of the fabric? oh my gosh. I just found this, and I think I love you. Are you backstitching into one end of the crochet thread to keep it from pulling out when gathering? Or just knotting it at the start before you start stitching over it? This is so clever. i was always taught to do three rows of long stitches to get the perfect gathers. I wish I had this pin before I made all the costumes that had miles of gatherings. I just used your method on a costume I am working on right now and it was nice not having the thread breaking every few minutes. Thank you for such a great sewing hint. It will save us so much time and frustration. Oh my gosh, I love you. What a time saver and stress reducer! I’ve been taught a similar method for gathering that uses regular sewing thread straight from the machine instead of the crochet thread. This looks so much easier. love the idea for hassle free gathering…. I don’t crochet but I do have a good supply of button and canvas thread….. I do believe that you’ve just changed my life. I’m working on a vintage machine and I could never seem to make gathers work for me without doing them by hand. I can’t wait to see what else you have on your site! I’m off to the hemming kits tutorial next! Oh yes I hope it makes it way easier I seriously love this trick! I also use this to gather with. I run TWO rows of gathering, if I am using upholstery fabric, especially if it is folded and their are two pcs of fabric to gather. You can put tension on it and gather a little tighter. Get to the end, place a straight pin and wrap the thread like a cleat, don’t actually tie it off. You might need to make adjustments. Thanks. I have also used dental floss. Same procedure, zig zag over it etc. This is fantastic! I’m gathering sleeves on a pirate shirt at the moment and this has just saved my sanity as threads keeeept breaking on me. Thank you so much. Dental floss works great too. Really great guide on how to gather. I’ve been trying to explain to my granddaughter how she needs to learn this. I’ll be showing her this guide. After you have the gathers how you want them, do you just leave the yarn in the material? Or how do you take it out?